The HYGINIST software tests compliance with an Occupational Exposure Limit Value(OELV) according to EN 689(2018) (clauses 5.4 & 5.5.3) or other exposure assessment strategies. Watch the YouTube video demos first. Click on DEMO of HYGINIST or on how to handle undetectables with HYGINIST. YouTube will open in a new tab in your browser. HYGINIST helpt bij de planning en de beoordeling van metingen aan (bio)chemische stoffen in de werkplek atmosfeer. Lees de Engelse of de Nederlandse produkt informatie of druk op download voor de nieuwste versie van het programma. HYGINIST vous aide avec l'évaluation de l'exposition au risque toxique sur les lieux de travail par échantillonnage de l'atmosphère. Lire l'information ci-desous (en Anglais) ou cliquez pour télécharger le logiciel. The HYGINIST Help on goodness-of-fit and the context sensitive Help topics are improved. The HYGINIST Help and the context sensitive Help topics are made as a HTML file Hyginwin.chm, supported by Windows 98, ME, 2000, XP Vista and 7/8/10. The program is now made using the Microsoft(R) Visual Basic 6.0 interpreter and compiler, for executing on 32 and 64-bit Windows systems. The non-central Student test, introduced by Tuggle (1981) in industrial hygiene, is now embraced by BOHS/NVvA for the group compliance test. French IH directives and BOHS/NVvA use 70% confidence in the group compliance test. This 70% confidence value is now the default in HYGINIST. HYGINIST is included in the NVvA/BOHS compliance testing guidance. However, use this guidance with care. Not as it unfortunately promotes a 200 €, outdated statistical tool which seems to be still under development. But it support a B&W test for differences between members within the SEG that may deliver a negative variance (which is marginalized based on reputation), that is claimed to be validated using limited simulations, that has an unknown mathematical distribution and that falsely may earmark workers as more dirty than other members of the Similar Exposure Group (SEG). . To investigate if workers or locations are falsely combined in a SEG, it is advised to use the classic and robust variance ratio Fisher ANOVA test for repeated measurements (described in detail as an Excel application in the Annex 1 of the guidance) or the two sample Student t-test (within HYGINIST as the last tab, for equal and unequal GSDs). This, to prevent which may happen with the B&W test. The statistical evaluation of series exposure measurements is an essential element in working conditions control and in assessing the health risk of inhaled chemicals. HYGINIST is a tailor-made, industrial hygiene statistical tool. It evaluates the exposure data collected with the standard exposure assessment strategies. It draws probability plots of three to two thousand data and tests the goodness-of-fit with the Lognormal distribution. In contrast to other programs HYGINIST helps you to develop a cost-effective sampling plan, uses unbiased estimates for exceedance and noncompliance and takes maximum information out of data below the detection limit. In summary HYGINIST makes it possible to do timesaving exposure evaluations of high quality. So, if you need to evaluate series environmental or personal air samples, then use HYGINIST. Watch the YouTube video demos first. Watch than how to handle undetectables with HYGINIST or on . A new tab opens in your browser with the YouTube. Press HYGINIST to download the latest version of the program. Occupational risk assessment and compliance control is often based on the evaluation of series air-exposure data collected using baseline, compliance or worst-case surveys. For occupational hygiene professionals it is important that the evaluation of the exposure data is done swift, simple and solid. An industrial hygiene program free of charge. Strategy: which type of exposure measurement can be evaluated? HYGINIST can do the most effective evaluation on many different combinations of exposure data and limit values. The ratio of the sampling time duration and the defined reference period of the limit are usually the determining factor. Confidence that the upper limit of the concentration distribution C95% is below the Ceiling. NIOSH Occupational exposure sampling strategy manual (Leidel 1977). To analyse raw exposure data you can best put the numeric outcome in a notepad text file with the extension ".hyg" and handle the file as described in chapter 2.2.4 van of the manual "Hyginwin.chm ". Data can be entered by keyboard. The text file option saves time and increases the quality when evaluating large sample series. The files loaded from disk can originate from data logging systems or can be extracted from different types of database or data-management programs. HYGINIST draws for you the laborious probability plot (see the adjacent picture) and corrects for tailor error when using small samples. Different transformations can be compared visually or using the Shapiro and Wilk test. The manual teaches you how to recognize the deviations from the Lognormal distribution and how to handle in those situations. If some concentrations are below the detection limit, then often one half of the detection limit is used as a dummy value. Far more effective is the method used in HYGINIST: the descriptive statistics are estimates from de slope and the mean of the linear regression line through the concentrations within the accuracy limits. Mouse right click "Open in new tab" to watch the demo on how to handle undetectables with HYGINIST. The program helps you to calculate the smallest sample size for a long-term exposure assessment program and to establish the results of improved working conditions. Windows that present the results of calculations can be appended to the HYGINIST.LOG report text file. You can copy the graphics using the Print Screen key. You can also bitmap the graphics by using a screen capture program. The bitmapped graphics can be imported in most professional word processing programs and appended in your exposure assessment report. 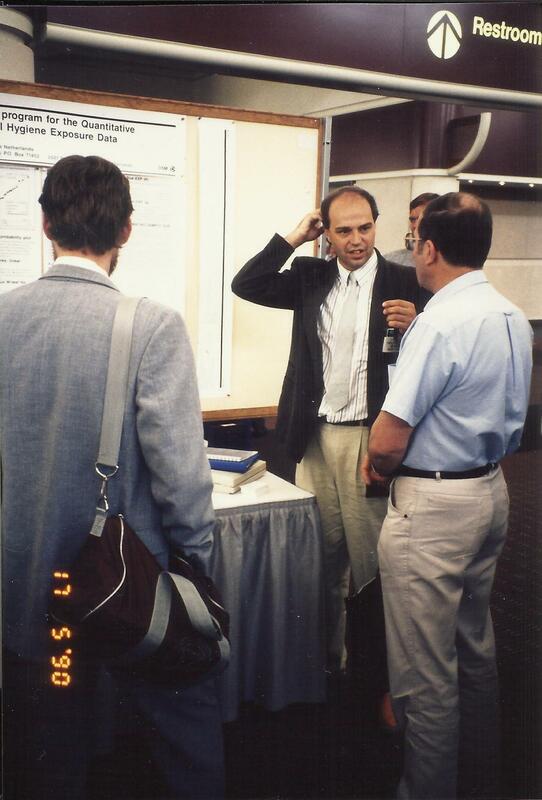 The first english version of HYGINIST was released at the AIHCe 1990 in Anaheim (USA). A comprehensive review has been published in the Annals of Occupational Hygiene (1995 Vol. 39 pp. 873-877), written by Peter Dewell a British occupational hygienist and statistician. The AIHA Exposure Assessment Strategies Committee (EASC) has reviewed the program. They found it "a powerful statistical tool that has the potential of making a significant contribution to the industrial hygiene community" (EASC 1994 Annual Report). HYGINIST is mentioned in the 2nd edition of the AIHA Exposure Assessment Strategies Manual (Mulhausen 1998). Its use is recommended by Chemical Manufacturing Association (Harris, 1993). The BOHS/NVvA compliance testing guidance (2011) describes the additional power of HYGINIST over the Excel type software like IHSTAT. Since 1996 the program is distributed as freeware and it is now used throughout the world in at least 20 counties. HYGINIST is programmed in Visual basic 6.0 and can be executed in Windows 95/98/ME/2000/NT/XP/Vista/7/8/10. HYGINIST works in Windows 10 and earlier versions (both 32 and 64 bits) . The conversion to VB6 and HTML makes the installation of "WinHlp32" obsolete. HYGINIST is het computer programma voor het steekproefsgewijs plannen, interpreteren en toetsen van metingen in de (werkplek)atmosfeer. Klik op een index item voor meer informatie. HYGINIST is een speciaal voor de arbeidshygiëne ontwikkeld statistisch software pakket. Het analyseert de meetuitkomsten die verzameld zijn met behulp van de standaard arbeidshygiënisch strategie en toetst deze tegen de grenswaarde. Het tekent op het beeldscherm de verdeling van drie tot tweeduizend meetuitkomsten alsof het op logaritmisch waarschijnlijkheidspapier is. Ook de overeenkomst met de log-Normale verdeling wordt getest. Het helpt bij het kosten-effectief plannen van een meetprogramma, gebruikt zuivere schatters voor de kans op MAC overschrijding en haalt maximale informatie uit de uitkomsten onder de detectie grens. Samenvattend HYGINIST bespaart tijd en geld bij de planning en interpretatie van arbeidshygiënische metingen. Als je series lognormale meetuitkomsten moet beoordelen, dan is het gebruik van HYGINIST sterk aan te bevelen. Bekijk eerst de YouTube demo videos. Klick op HYGINIST DEMO of op Slim omgaan met meetuitkomsten onder de detectiegrens. A new tab opens in your browser with the YouTube. Press HYGINIST to download the latest version of the program. Het beoordelen van het arbeidshygiënisch risico op werkplekken met blootstelling aan chemische stoffen is een (wettelijk verplicht) onderdeel van de zorg voor de arbeidsomstandigheden. Persoonsgebonden werkplekatmosfeer metingen kunnen daarbij essentieel zijn. Maar hoeveel metingen zijn er minimaal nodig? En hoe vergelijk je de metingen met de grenswaarde? Hoe extrapoleer je naar de niet-gemeten periodes? En hoe .....? Laat HYGINIST deze vragen voor u beantwoorden. Lees over de unieke en gebruikersvriendelijke eigenschappen van dit in Nederland ontwikkelde programma met een hoge internationale waardering. De evaluatie die HYGINIST toepast is conform de "Wettelijke Regelingen Grenswaarden" van het Arbeidsomstandighedenbesluit (ARBO-wet) en de daarin genoemde Nederlandse/Europese norm NEN/CEN 689 "Werkplek atmosfeer - Richtlijn voor het vaststellen van de blootstelling door het inademen van chemische stoffen voor de vergelijking met grenswaarden...". HYGINIST beoordeelt meetseries zowel kwalitatief als kwantitatief. HYGINIST gebruikt daarvoor de best passende statistische methoden op een gebruikersvriendelijke wijze. Het houdt daarbij rekening met steekproefomvang, detectiegrenzen en afwijkingen van de log-Normale vorm. In HYGINIST kunnen meetgegevens via het toetsenbord worden ingevoerd. Meetseries kunnen ook als bestand worden ingelezen van de harde schijf. Dit laatste bespaart niet alleen tijd en maar verlaagt de kans op fouten bij het invoeren van grote aantallen uit bijvoorbeeld dataloggers of database/datamanagement programma's. HYGINIST neemt het arbeidsintensieve tekenen op waarschijnlijkheidspapier van u over en corrigeert daarbij voor de staartfouten. Diverse transformaties zijn visueel en met de Shapiro test onderling te vergelijken. De handleiding leert de afwijkingen van log-Normaliteit te herkennen en geeft aan hoe ermee om te gaan. Metingen buiten het detectiebereik worden vaak weggegooid of krijgen een dummy waarde. 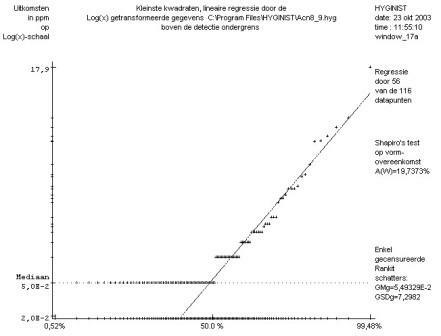 Veel beter is de HYGINIST methode waarbij de statistische kengetallen worden geschat uit de lineaire regressie door de uitkomsten in het detectiegebied. Strategie: Welke metingen kunnen geëvalueerd worden? Blijft de momentane concentratie C onder een bepaald piek niveau? Hoe vaak overschrijdt de gemeten concentratie (Ct) de grenswaarde ? De tweede evaluatie methode wordt het meest toegepast. Het belang van de laatste evaluatie methode neemt sterk toe. Hiermee wordt de lange termijn dosis van agentia met een lange termijn effect (o.a. geluid, straling, reprotoxische stoffen) bij werknemers bepaald. En vervolgens getoetst tegen lange termijn (40 uur tot 1 jaar) grenswaarden (lood, asbest vinylchloride) of de risico grenzen kankerverwekkende stoffen. HYGINIST evalueert ook de meetseries die uitgevoerd zijn volgens de beoordelingsstrategieën van de Arbeidshygiëne verenigingen in de USA (Hawkins 1991) en in Engeland (Guest 1993). HYGINIST berekent de minimale steekproefomvang waarmee de kans op grenswaarde overschrijding nog net voldoende laag is. De HYGINIST schermteksten en de bijbehorend handleiding zijn vanwege de internationale verspreiding in het Engels. De vierendertig genummerde schermen worden in zeven hoofdstukken stap voor stap uitgelegd. Een dertigtal meetseries uit het hele arbeidshygiënisch werkgebied zijn als voorbeeld volledig uitgewerkt. Een aantal afloopschema's zorgt dat de meest effectieve evaluatie wordt gevolgd. Ook plaatst de handleiding een aantal hardnekkige misvattingen in de juiste context. De schermen met resultaten kunnen opgeslagen worden in een HYGINIST.LOG bestand. Dit ASCII bestand is in de tekstverwerker te laden. Door de standaard schermopmaak met de naam van de meetserie, de evaluatiedatum en het schermnummer is de relevante informatie is eenvoudig terug te vinden. De waarschijnlijkheidsverdelingen zijn vanaf het beeldscherm op veel printers af te drukken of als bestand op te slaan (in Windows met het klembord in DOS met WordPerfect's GRAB.COM en andere "screen capture" programma's). Na een freeware voorloper (genaamd ARBSTAT, 1987) verscheen in 1990 HYGINIST in de publicatie reeks van de Nederlandse Vereniging van Arbeidshygiëne (NVvA). Na een poster presentatie tijdens de AIHCE-90 in Orlando (USA) is op verzoek van de American Industrial Hygiene Association (AIHA) vervolgens een internationale, Engelstalige versie ontwikkeld. Deze versie kreeg in 1994 van de AIHA's Exposure Assessment Strategy Committee (EASC) het predikaat "A powerful statistical tool that has the potential of making a significant contribution to the industrial hygiene community". In Engeland schreef Peter Dewell al in 1995 een review voor de Engelse Institute of Occupational Hygienists (Annals of Occupational Hygiene vol 39;1995; blz. 873-877). In het Maandblad Arbeidsomstandigheden nr. 6 uit 1995 blz. 338 t/m 340 staat een een uitbreid artikel over HYGINIST. Daar zijn een aantal voorbeelden uitgewerkt. Sinds 1998 wordt de HYGINIST als freeware verspreid. De standaard statistische software pakketten hebben vaak geen of zeer beperkte mogelijkheden voor het analyseren van log-Normale verdelingen. Hetzelfde geldt voor uitkomsten buiten het detectie bereik. Dit, de grafische en statistische beoordeling van de vorm, de steekproefomvang afhankelijke toetsen en de zuivere log-Normale extrapolatie methoden maken het programma uniek in zijn soort. Omdat de levensduur van locomotieven, de omvang van vispopulaties, het inkomen van o.a. de Nederlandse arbeidshygiënisten, de duur van de douchebeurt en nog vele andere natuurverschijnselen vaak het best beschreven kunnen worden met de log-Normale verdeling is HYGINIST ook buiten de arbeidshygiëne bruikbaar. In samenwerking met IndusTox Consult is een één-daagse interactieve workshop ontwikkeld over de achtergronden van HYGINIST en het kosten-effectief beoordelen van de werkplekatmosfeer. Sinds 1994 zijn acht workshops gehouden, tot grote tevredenheid van ruim honderd deelnemers. Voor groepen van vier of meer gebruikers kunnen specifieke korte instructiecursussen worden georganiseerd. HYGINIST gemaakt met Visual Basic 6.0 en draait op Windows 98/ME/2000/NT/XP/Vista/7/8/10 .